The RFG Nozzle is designed to provide a more random flow pattern in your aquarium. Instead of just producing a laminar flow pattern like most aquarium nozzles, the unique internal shape of the RFG Nozzle causes the water flow to randomly change direction as it exits the nozzle. Does it rotate or have any moving parts? No – the RFG design has no moving parts . This means you can enjoy the random flow pattern without having to worry about internal gears or parts getting stuck or worn out. Five internal fins form a set of spiraling channels. When supplied with 290 GPH or more of flow, the spiraling shape of the channels produces enough turbulence to cause the stream to randomly change direction as it exits the nozzle. How do you install the RFG Nozzle? Easy – the 1/2in and 3/4in RFG Nozzles sizes simply snap to the end of standard loc-line. 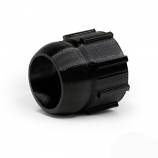 The RFG was specifically designed to easily attach while still maintaining a secure fit. The 1in RFG Nozzle on the other hand is designed with a slip-fit end that snuggly fits standard 1in PVC pipe – no glue required. All three sizes are just as easy to remove with very little effort for cleaning. How do you use the RFG? The RFG Nozzle is designed to produce a more random flow pattern than standard loc-line nozzles. This can be very beneficial to your reef aquarium. Corals tend to grow in more natural patterns when the flow passing over their branches is not laminar in nature. 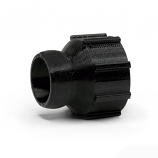 Use the RFG Nozzles on your main return lines or in a closed loop system. When supplied with at least 290 GHP, the nozzle begins to produce a randomly oscillating flow pattern. Use more than one RFG in your aquarium for even greater effect. I have an All-in-One Aquarium, will it fit? 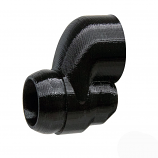 If your aquarium has a 1/2” or 3/4” loc-line fitting on the return line then yes, the RFG will fit your aquarium. 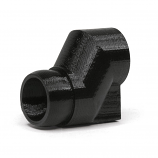 If you have a straight pipe connection similar to those used in many of the Red Sea Reefer and the Innovative Marine all-in-one aquariums, we offer slip-fit drop adapters to use with the RFG. This places the RFG lower in the water to prevent less splash and a vortex from occuring. If you have a Red Sea Max aquarium with a 16mm straight nozzle, then yes, we have a specific nozzle adapter just for you. The RFG Nozzle is 3D Printed? 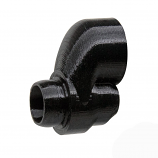 All the of the products offered by VCA are both designed and manufactured on-site using FFD (Fused Deposition Modeling) 3D printing techniques. What type of plastic material is it made from and is it reef safe? The RFG Nozzle and other parts or accessories we manufacture which come into contact with aquarium water is 3D printed using PETG plastic. PETG, or Polyethylene terephthalate, is a plastic resin of the polyester family. PETG is commonly used to make beverage, food and other liquid containers. Is the RFG Nozzle like the other accelerator or vortex nozzles I’ve seen? 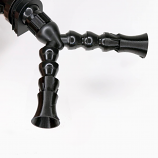 The RFG Nozzle’s represents a twist on an old idea with completely new results. The primary focus of the RFG is creating a random flow pattern, as opposed to accelerating the flow. This means you can crank up the flow on your return pump without blasting your coral or aquascape. The internal shape is very different from the standard accelerator nozzle that we all know. Instead, the RFG contains 5-vane internal helix that runs nearly the entire length of the nozzle and form a set of internal channels. Each channel is connected to an eductor at the base of the nozzle. This internal spiral, together with the eductors, contributes to the distinctive water moving properties of the RFG Nozzle. The old school accelerator and vortex nozzles simply can’t create the type of water movement the RFG is capable of.